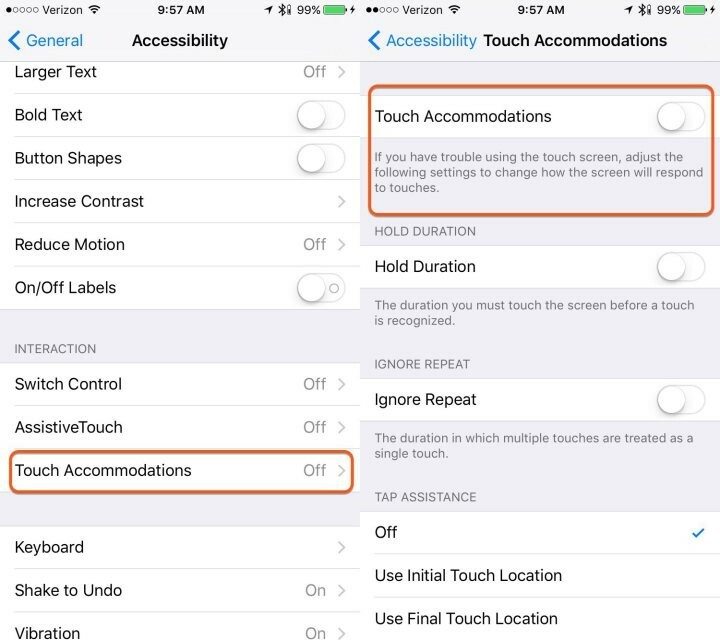 Touch Accommodations were introduced to Accessibility Settings as part of the iOS 9 update. For those of us working with people with disabilities, this is one of the most important advances in accessibility features since the introduction of switch control. Touch Accommodations allow us to optimize the way in which the touch screen responds to a user’s touch, making it more responsive to those with shaky hands or decreased accuracy, common characteristics among people with motor disabilities. To activate Touch Accommodations go into Settings -> Accessibility -> Touch Accommodations (under the Interaction category). 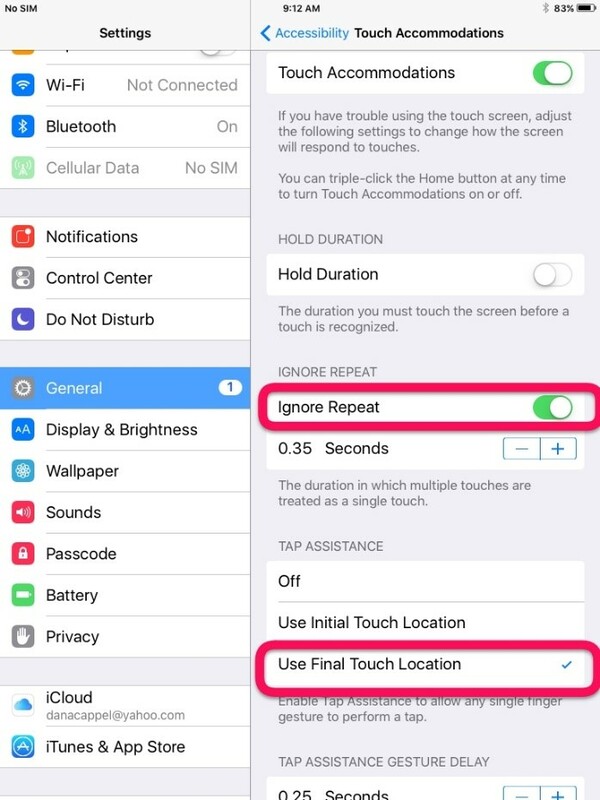 It is advisable to set the various settings first and then turn on the Touch Accommodations, as the settings you choose will apply to all touch on the iPad, possibly making settings adjustment awkward. Hold Duration – Here you can determine the length of time a single touch should be in order to be considered intentional. This is useful for those that may touch the screen unintentionally before touching the intended target. Ignore Repeat – Here you can set a length of time in which repeated touches are considered a single touch. This is especially useful for users with a shaky hand who may unintentionally touch the target multiple times, or for others still in the learning process who continue to touch their intended target multiple times before waiting for a response. S, a grade 2 student at the Beit Issie Shapiro School for Special Education, uses TouchChat, an AAC (alternative and augmentative communication) app. He tends to touch the screen multiple times when touching a symbol. Before touch accommodation settings, this style of touch would take him to unintended boards and the staff would need to intervene and take him back to where he intended to be, reducing his ability to be independent with his communication device. Using Touch Accommodations, we set the Ignore Repeat at 1 second and now the iPad recognizes his intended touch and he is able to navigate through his boards without going to unwanted places. He is more independent and his communication is more effective. Tap Assistance – This setting is intended for those whose finger slides on the screen to or from the intended target, causing the screen not to “understand” what the intended target of the touch is. Here you can set either the initial touch location or the final touch location as the intended target, depending on the user’s style of touch. This setting is useful for all activities including communication, typing, and play. A is a 10 year old student in The Beit Issie Shapiro School for Special Education. She uses her iPad for communication and also loves to play her favorite apps. A’s physical disability affects the accuracy of her touch and she tends to touch the screen at a point and then continues to slide or “walk” her fingers along the screen until she reaches the icon she wishes to press. This can be troublesome when she is trying to open her favorite app and instead opens something else, or activates a different part of a game than the action she intended. As well, she tends to touch the target repeatedly. For A we turned on Ignore Repeat and Tap Assistance, which we set to “Use Final Touch Location”, allowing her greater success and less frustration when using her iPad. We love that Apple considers accessibility solutions like these, and they are in fact essential accommodations for many users with disabilities, making their use of the technology more efficient and successful. We hope that they continue to create accessibility solutions like these and that we start to see them in other operating systems as well.